One week after ANC presidential hopeful Nkosazana Dlamini Zuma’s campaigners denied that she had any “clandestine and dodgy relations with anybody throughout her political career”, pictures of her with some allegedly dodgy characters have emerged. If previous storms are anything to go by, she’s likely to try dodging accountability for this one too. By CARIEN DU PLESSIS. How ironic that the woman who gave South Africa smoke-free restaurants and who gave former president Thabo Mbeki beef about his pipe habit would, in the pursuit of the highest prize of her career, be associated with cigarette men. Worse, actually: a man who has confessed to illegal dealings with tobacco, smuggling it into the country without paying the taxes that contribute to things like healthcare for smokers. The Sunday Times this weekend published another story on ANC MP Nkosazana Dlamini Zuma and Adriano Mazzotti. It reported she met Mazzotti and his business associates, saying that, despite her denials that they know each other well, and despite Mazzotti saying they met only once, pictures on social media seem to prove that they had spent time together. On Instagram there were photos proving at least two meetings between Dlamini Zuma and Mazzotti, and in another picture, apparently taken in Greece, one of his associates embracing her. Gambling tycoons Philip and Photios Anastassopoulos, together with Mazzotti, are reported to have met with Dlamini Zuma in the United Kingdom and Greece to try to raise funds for her campaign. Philip posted a picture saying: “Another nice day with mama Zuma” and beneath another picture of himself, Mazzotti and Dlamini Zuma on Instagram, he said he “had a good week with mama Zuma and Adriano in London”. Of course, the businessmen could merely be trying to name-drop, by way of Instagram selfies, to gain street cred. The Sunday Times, however, reported that sources claim the trio had been funding her presidential campaign, and that they were so dodgy that she couldn’t let her campaign team in on the meetings. Given what’s been alleged about some of her campaigners, this is hard to imagine. Whatever the truth, in politics perceptions count, and it’s perhaps telling that Dlamini Zuma isn’t doing much to address the allegations in the newspapers that reported them. This week a spokesman, Vukani Mthintso, conceded she had met Mazzotti while on a trip to London (she actually went there to address an Invest Africa business lunch, but wasn’t too well received because her speech was short and didn’t allow questions about contentious issues such as land), but denied any relationship or that they were funding the campaign. Around her, supporters on Twitter, like the ANC Women’s League last week, claimed it was a smear campaign by “white monopoly capital”, side-eyeing the media. Her personal Twitter timeline, @dlaminizuma, was also pretty busy on Sunday, as if it was being controlled by a bot or by a young person with a lot of time on their hands. Her timeline was flooded with three variants of tweets saying: “Some of My Reflections #FactsAboutNDZ”, accompanied by pictures of her expressing her thoughts about radical economic transformation, agriculture, and political versus economic freedom. The tweets seemed to be randomly responding to tweets related directly or indirectly to her campaign. This response to the latest campaign fund allegations echoes the way she has dealt with previous crises, when she ducked accountability and was protected by her comrades as well as the highest office. In 1995, just over a year into her ministry of health, her department awarded a R14-million contract – a substantial sum at the time – to a playwright, Mbongeni Ngema, a friend of hers, to produce Sarafina II. The play turned out to be a massive flop, the contract turned out to have been irregularly awarded, and it emerged there were much cheaper contractors, at R600,000. Dlamini Zuma in response to a parliamentary question said the money came from funds given for HIV/Aids campaigns by the European Union, but the EU said there was no such item in the budget. Despite this, Dlamini Zuma was supported by the ANC caucus in Parliament as well as then president Nelson Mandela, who said “she has fully explained [the affair] to me and I fully support her”. Then deputy president Thabo Mbeki also said there was no misuse of public funds in Sarafina II. The Public Protector later found Dlamini Zuma had given misleading, false and exaggerated information to Parliament as well as to the media through press releases. There were also counter-smears from the ANC against the opposition, which was asking for Dlamini Zuma’s head, and against the media, which was labelled “racist”. Twenty years later, her recipe for responding to crises is still similar. So far the details about her relationship with Mazzotti and the Anastassopoulos brothers have not been subject to an investigation, and are allegations only at this stage. 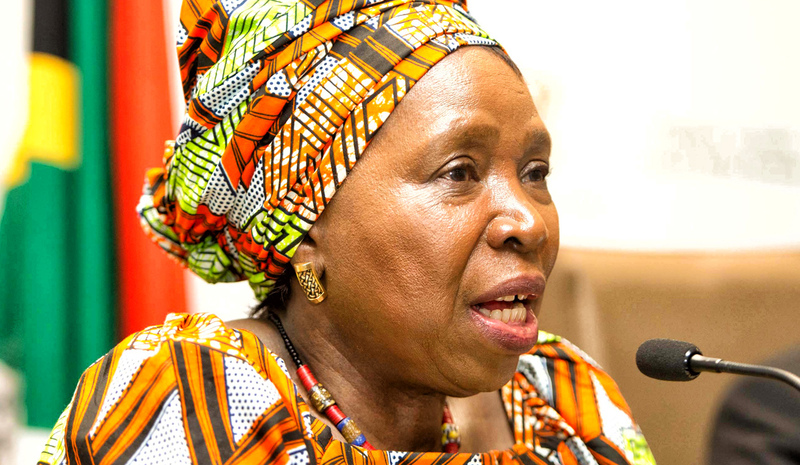 However, the way the ANC Women’s League has already rallied around her to support her, countering the stories with claims hinting at racism and money interests, suggests that Dlamini Zuma would prefer details of this specific issue to remain obscure. Photo: Dr Nkosazana Dlamini Zuma addresses African Editors and Press Officers, Africa Editors Forum, 24 Oct 2016 (Photo: GCIS).